Two of my favourite blogs, Dynamic Ecology and Small Pond Science, both produce end-of-week compilations of links to interesting items on the web. On the basis that plagiarism imitation is the sincerest form of flattery, I thought I’d follow suit with a regular series of posts to biodiversity-related* items that have caught my attention during the week**. This is the first one. In an article in the Times Higher, John Warren and colleagues discuss their concern about the decline in graduates with species identification skills. They raise some valid points that echo worries that others have raised in the past, but I question their assertion that “each year there are fewer than 10 UK graduates who are proficient enough in field identification skills to be employable”. I’d like to see some evidence to back that up. Scientists find evidence of wheat growing in UK 8,000 years ago – which is 2,000 years earlier than previously believed. Mr Spock has died; I’ve always loved Star Trek and Leonard Nimoy’s passing is sad news. But he lived long, and he prospered, and we can’t ask more from life than that. Tropical deforestation may have actually accelerated, not decreased, according to a new study. But Brazil is faring better than other countries. A great example of a mutualistic interaction between a carnivorous pitcher plant and a species of bat that makes its home within it. Bat gets somewhere to live; plant gets pooh; everyone wins. **Feel free to recommend links that have caught your eye. Back in October I was staring out of the window of the office that I share with my colleagues, something I often do when I’m pondering a question or trying to add a tick to our “Birds Seen Out of the Window” list*, when I spotted something odd. 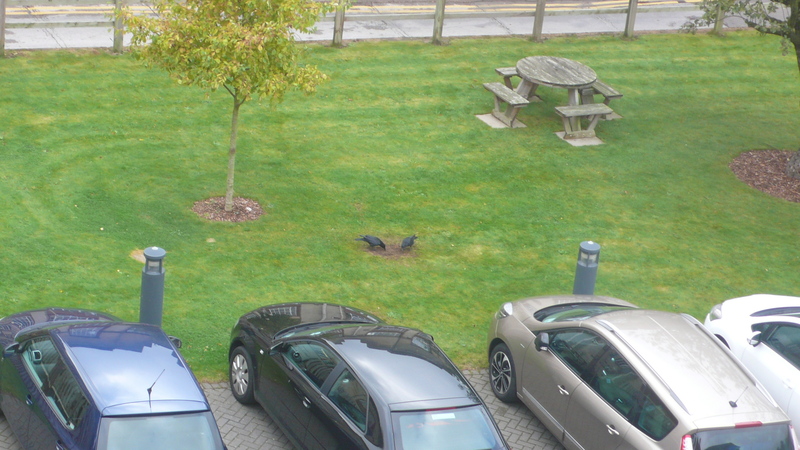 A pair of crows had focused their attention on a brown patch of lawn and appeared to be eating the grass. I’m not much of a birder but I do know enough about crows to realise that grass is not a regular feature of their diet. The same behaviour was observed a few other times after that, and on other occasions magpies were seen doing the same thing. What could be going on? Once I’d taken a closer look at the patch of dead grass the explanation was clear. During our first year undergraduate induction week about a month earlier there had been a barbeque set up on that spot which had leaked hot fat onto the grass. What the birds were eating was dead grass coated in lard, a useful source of fat to store for the cold conditions of the oncoming winter. That’s one of things I love about urban birds such as corvids and gulls: they are adaptable and will exploit any resource that becomes available. But how had they located the patch of fatty grass? Were they simply exploring the lawn and stumbled across it by accident? Seems plausible especially as they often feed on earthworms on the adjacent parkland. Could they smell it? The acuity of birds’ sense of smell has been the topic of considerable debate, but that’s certainly a possibility. I was reminded to post this (originally half-written before Christmas) by a story on the BBC news website this morning about a young girl in the USA who receives gifts from the crows in her garden. If you’ve not read it, please do: it’s a wonderful example of positive interactions between humans and the rest of biodiversity. Crows (and other corvids) get a bad press, being often described as “evil” (surely a term that only applies to humans) and blamed for the demise of “nicer” birds – a reputation that is not completely justified, as a recent post on Kaeli Swift’s crow research site demonstrates. So, learn to appreciate (even love) the crows in your local neighborhood; they will reward you with some entertainment as you watch their behaviour, if not necessarily with gifts. *currently standing at 19 species and rising every month. This morning I had a very constructive meeting with some colleagues to discuss setting up a new blog/podcast series for the university. It reminded me that I wanted to post something about how long it takes to build up a blog readership , specifically in the sciences. The figure above shows the monthly number of views of my blog from its inception in March 2012 up to January 2015. The line is a second-order polynomial, just to aid interpretation rather than to make any kind of statistical inference. For the first year and a half of the blog’s life, monthly views were typically in the range 200-400, occasionally getting as high as 600. Only after that was there a trend of increasing numbers month-on-month, but even that was not consistent, with some periods of low readership. In part this relates to how frequently one blogs: more frequent = more monthly views, and I have been posting more often of late. 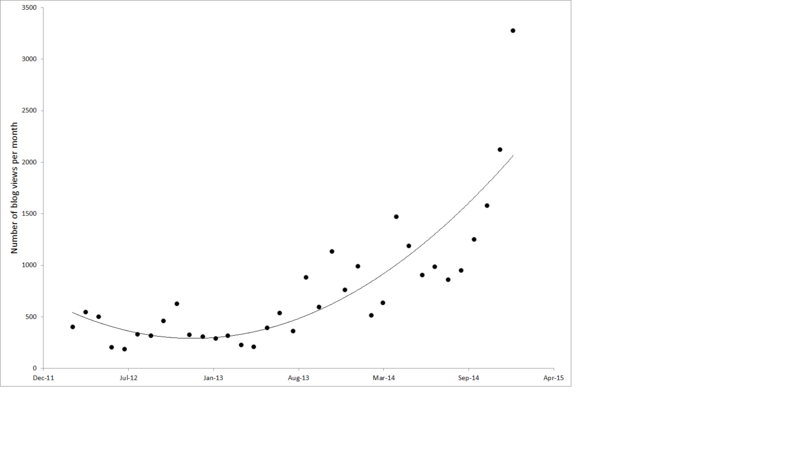 But that’s only part of the story and the figure also demonstrates that it takes time to build a readership for a blog. For example, 4 posts in March 2012 attracted 402 views; the same number of posts in April 2014 received 1,469 views, and 2,120 in December 2014. A lot of scientists (particularly early career) are starting to blog, sometimes because they think it’s the right thing to do: they see others doing it, and it’s encouraged by funding agencies, etc. Sometimes these blogs are very successful; other times they falter after a few posts, perhaps because the writer loses interest. I’m not in a position to offer much advice about blogging as I’ve only my own experience on which to draw, but I would say that it requires persistence: don’t assume that you’re going to get a big audience from the start, it takes time to build a readership. Evolving a naturalist – happy birthday to me! Somehow, today is my 50th birthday. So I thought I’d mark it with a short post about my personal evolution as a naturalist and, ultimately, professional scientist. One of the great things about the internet and social media such as Facebook is that you can make exciting discoveries on a weekly basis. 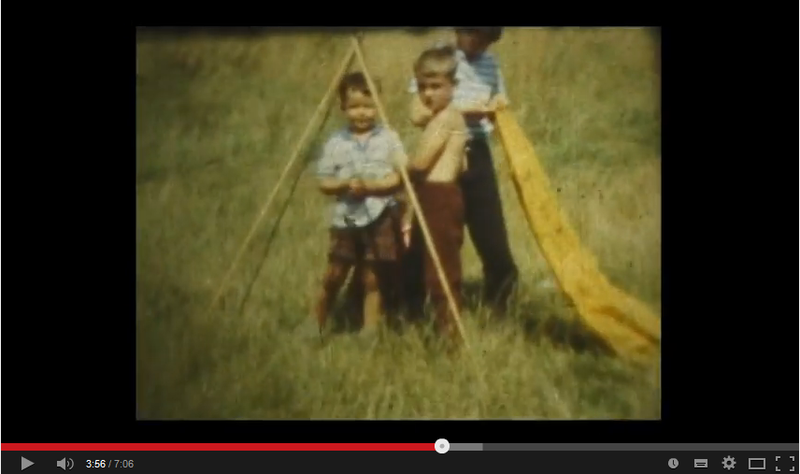 Recently I found out something that means a lot to me on a very personal level: I discovered that a family* who lived in the same street when I was growing up in Sunderland in the 60s and 70s have digitised some old home movies and made them available on YouTube. In our digital age in which every phone and camera can capture and share events as they happen, it’s sometimes easy to forget that owning a movie camera in the 60s was quite a rarity and the majority of kids living at that time were never filmed. These movies are exciting not just because one of them shows me aged about 5 years (in the blue shirt) playing with friends (I’m there from 3’53”) but because it documents, in colour and moving pictures, one of the reasons why I became a professional naturalist with a deep fascination for biodiversity. Up until the 1950s this area had been very built up, with the houses, shops and pubs serving the local families who were employed mainly in the shipyards and coal mines to the north of the town. You can get a sense of how urban it was from this 1898 map of Southwick; the places I refer to are just south-west of The Green to the left of the map. Following demolition the sites were left to their own ends, and were colonised by plants, insects, birds and mammals from patches of habitat closer to the river that had either been cleared of buildings earlier in the century, or which had never been built upon at all. There are some nice areas of magnesian limestone grassland nearby along the higher banks of the River Wear valley, and typical calcicole plants such as Greater Knapweed (Centaurea scabiosa) could be found on these post-demolition grasslands. In fact, in the absence of horse chestnut trees, we used to play a version of conkers using the unripe seed heads of Greater Knapweed. Was that an echo of earlier children’s games in Britain, prior to the introduction of horse chestnuts in the 17th century? Apparently similar games were played with snail shells and hazelnuts. If you watch the opening minute of this piece of footage from the same series, and ignore the girls posing and playing in the foreground, the background reveals a rich flora of plants, with butterflies hopping between flowers. The first bird species that I can remember identifying, and being fascinated by its bright colours, was Goldfinch (Carduelis carduelis) feeding on the seeds of tall thistles in the very area where this was filmed. The first butterfly that I could put a name to was the Small Tortoiseshell (Aglais urticae), also feeding on thistles, but this time on the nectar-rich flower heads, as a pollinator. We’d collect its caterpillars from the nearby nettles and raise them in jars. So you don’t have to have had a rural upbringing to appreciate and benefit from nature, and to later influence your profession and passions, any piece of land can inspire interest in kids, regardless of its origin, if nature is left to colonise. Unmanaged, semi-wild green space within towns and cities has huge value, both for wildlife and for the culture of childhood. They need to be protected just as much as rural nature reserves, including the generally disparaged but actually biodiverse “brownfield” sites, as Sarah Arnold has discussed in a recent blog post. Some of the riverside grasslands still remain and I hope that they are fascinating new generations of kids with their colour and diversity and flouncing butterflies. But the post-industrial grasslands on which I played and looked for bugs and flowers are all gone; they were cleared and built upon in a flurry of housing and retail development in the 1980s. Perhaps in the future they may return if those buildings are themselves demolished and the land allowed to lie undisturbed for a while. That is what nature does: it ebbs and flows across our landscapes in response to human, and natural, interventions, endlessly changing and endlessly fascinating to the curious minds of children and scientists, no matter how old they are. *My sincere thanks to the Scrafton family who took the original footage, made it available on YouTube, and gave me permission to use it in this post. For reasons that will become obvious next week, I’ve been in a reflective mood recently and this first in an occasional series of posts about “data I will never publish” is one of the results of that reflection. When scientists have been doing research for a few years, most of them start accumulating a back-log of data. In some cases this is data that may be published in the future (for ecologists that means long-term data sets, which I’ve talked about before) but other data may be fragmentary or simply too limited to be publishable. Good data are hard won and I never, ever discard data: you never know when it may come in useful. So in this series I will present such scraps of data that I know I’ll (probably) never publish. Their purpose is to illustrate interesting points, to stimulate discussion and ideas, and hopefully they might even be of use to other researchers in one way or another (I’m happy to share the raw data, just drop me a line). This first data set was collected in the grasslands of Wytham Woods in 1991 when I was a research student. It subsequently ended up being used in my PhD thesis and in one of the papers that resulted from it (Ollerton & Lack 1998) but not quite in this form, rather embedded within larger analyses. 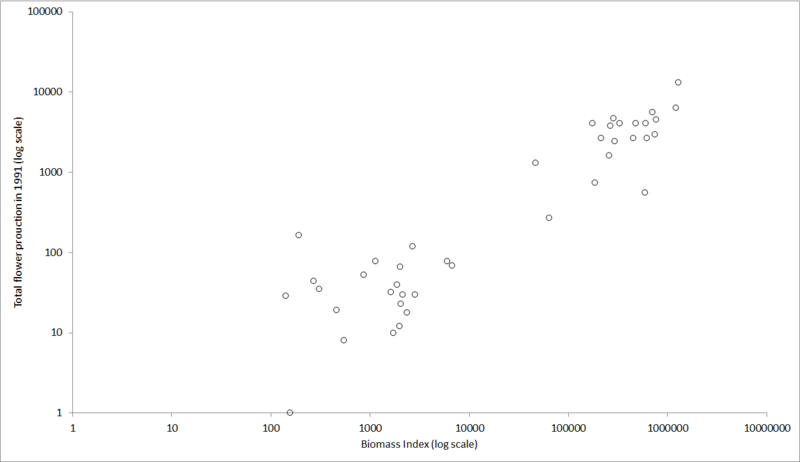 The graph above (click on it for a more detailed view) shows the relationship between individual plant size (measured using a calibrated non-destructive biomass index that I developed) and total flower production for that year, in the plant species Lotus corniculatus (Fabaceae), commonly known as bird’s-foot trefoil. This plant is a herbaceous perennial grassland species which can live for quite a long time (at least 50 years). The data show that plant size and flower production can span 5 orders of magnitude – the maximum number of flowers produced in one year by a single plant in this population was over 13,000, which is astonishing for a low-growing grassland species! in theory, there is no upper limit to the potential maximum size of plants. As long as they have appropriate growing conditions and are not limited by weather or disease or herbivory, they will continue growing. That’s because they are modular, constructed of iterations of basic units of the plant “body”, and show indeterminate growth. likewise, there is no upper limit to the number of flowers that can be produced because each modular unit can itself produce one or more flowers. plants can be very plastic in their response to the environment. The data form two clusters; the lower one (smaller plants) is from a sub-population that grew in a grassland that had never been fertilised. The upper cluster (larger plants) grew in an adjacent area that had previously been an arable field and in which there were still fertiliser residues present in the soil. The smaller plants are likely to have been older than the larger plants, but the latter had more soil nutrients on which to draw. 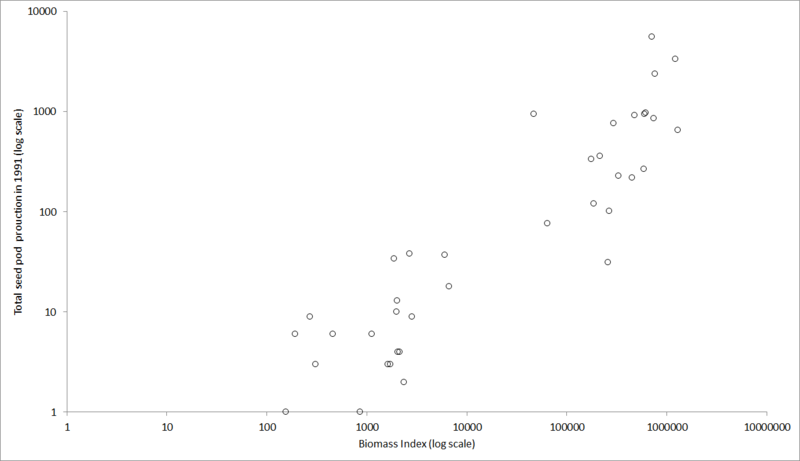 The following graph illustrates the same plants but this time it’s the relationship between biomass and number of seed pods produced. Still a linear relationship with no sign of a plateau; female reproduction in these plants just goes on and on (as, of course, does male function via pollen dispersal. This is one of the things that I love about plants: they are so flexible in their response to growing conditions!